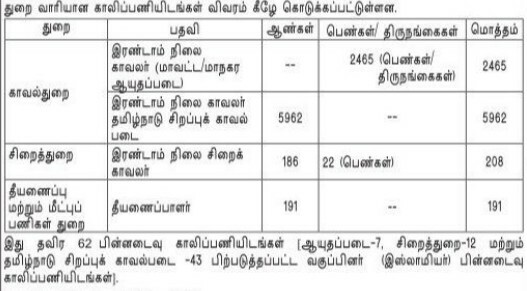 TNUSRB Recruitment 2019 Notification : Tamilnadu Police Recruitment board invites application form from the eligible interested candidates for the post of 8826 vacancies from the official website www.tnusrbonline.org to appoint Police Constable Grade II, Jail Warder Grade II, Fireman across various places in tamil nadu . Candidates who acquired the eligibility criteria may have to go for selection process mentioned in the TNUSRB Notification 2019. Candidates can know the eligibility criteria, selection process, online application form, how to apply, salary is mentioned below. Tamil Nadu police recruitment board will recruit every year for various vacancies available in the various police departments. This one is highest recruitment in the year 2019-20. So, applicants who fulfill this TNUSRB Eligibility criteria may need to know the entire details on TNUSRB official notification 2019 PDF which is given below. Candidates need to enter the official website of tnusrb www.tnusrbonline.org from 08.03.2019 to 08.04.2019. Applicants who possess eligibility criteria they must only should apply for TNUSRB Recruitment 2019. 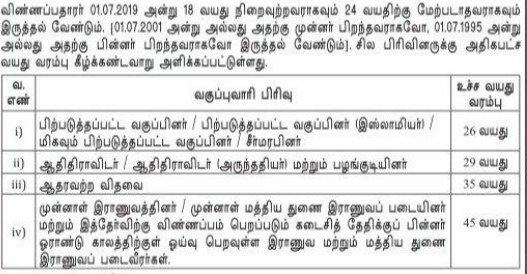 Tamil nadu police recruitment board going to conduct selection process for the applied candidates at various exam centres in tamil nadu. If you have any doubts on TNUSRB Recruitment 2019-20 on eligibility criteria, online application form, selection process, how to apply, application fee, important dates comment below we will reply as soon as possible.